Precious photographs of your newborn baby make for great keepsake memories that last a lifetime. When your little one arrives, it’s important to seek the service of a professional photographer who understands the right procedures to ensure a great, comfortable, and safe experience for your baby. Newborns are very delicate and can be unpredictable, which is why at Silver Bee Photography we never compromise the safety of your child in exchange of a great shot. We believe safety is extremely important during a photography session, and we have over 10 years of experience in capturing these beautiful moments for parents. Our team takes precautionary measures to set up the studio or location in a baby-friendly way before the shoot takes place. Less experienced photographers in this field can sometimes overlook important factors for making the environment child appropriate, like keeping the studio at a certain temperature, using soft props, or giving parents specific instructions prior to their session. Here are 5 extra measures that we take at Silver Bee Photography to ensure a completely safe experience, which result in beautiful memories for your family to treasure. There will always be an adult at arm’s length of your baby. Whether it be you, us, or a spotter, we ensure there is someone with your newborn from start to finish. Don’t worry about your arms or hands appearing in the shot – our software will edit them out with ease. Our studio is warm with space heaters surrounding the area, so you don’t ever have to worry about your newborn getting cold. We carefully monitor temperatures and keep a consistent climate in the room. Heaters are never placed too close to babies or props like blankets. Newborn babies need head support at all times, including during photoshoots! During upright poses, we will need you to support your baby. The rest of the time we use soft and safe props and bedding to get your perfect picture. Again, we always edit shots so that your baby, and not your hands supporting them, is the main focus of the photos! Newborn baby skin is very delicate, which is why all our props are soft, padded, and great additions to a photograph! Under no circumstances will we use dangerous props or place your little one in an object that could break. If there is a prop special to you that you’d like to appear in the images, by all means bring it in! 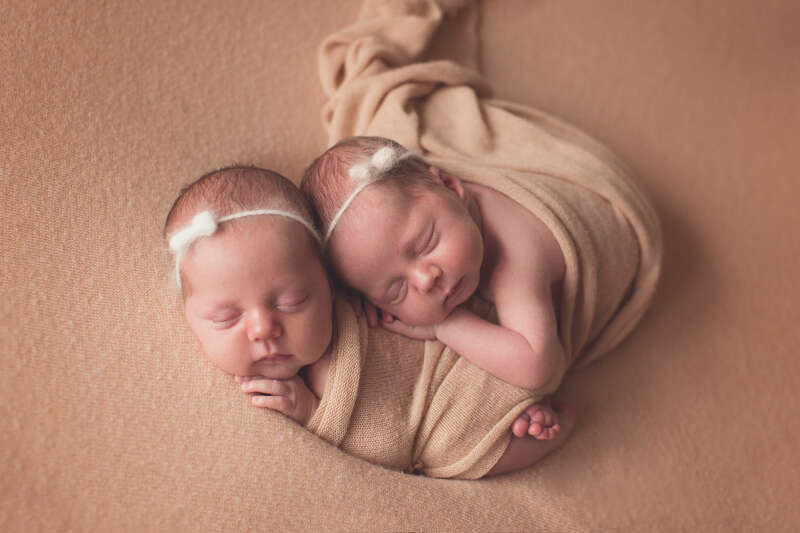 It’s obvious when a newborn is not enjoying a photo session – there are signs we look out for that suggest your baby might be fatigued, and we closely monitor their sounds and reactions. Whenever you feel that your baby needs a break, just let us know. Don’t be afraid to tell your photographer. We understand that they get tired, hungry, or just need to be held. Additional safety rules that we have in place include never leaving a child unattended – of course – or forcing babies into positions to get a great shot. Our photographs are taken in natural poses and settings that are comfortable for your child. That’s when the best shots happen! Lastly, whenever shooting above your little one, we always have our camera strap around our neck. We use soft shutter sounds and never use harsh lighting, so your child isn’t disturbed and looks comfortable in your photographs. When Is the Best Time for a Newborn to Get Their Photos Taken? Many of our newborn photography sessions take place only a few weeks after the baby is born. At this stage, the babies are very sleepy which makes them easier to work with! As they grow, they will gain more control over their bodies and limbs and be able to wiggle out of the cute pose you were aiming for. We suggest you schedule your session as early on as possible – once mom, dad and baby are all settled in! We advise that you have your shoot within the first 2-3 weeks after birth. Upon giving us a call or filling out our form to schedule an appointment, we will give you some important information about what you can expect during the shoot. This way, when your baby finally arrives all you must do is confirm the scheduled time. It is best to keep your newborn awake for at least two hours before your scheduled session. Then, feed your little one about 20 minutes before the shooting to encourage them to fall into a peaceful sleep! A sleeping newborn will be easy to position – and look very sweet! We invite you to browse through our newborn gallery to view some shots we’ve taken for previous families. These are memories that you will want to keep for years to come and we couldn’t be happier to take these shots for you! Our newborn photography sessions are never dangerous – but there are extra steps we take to ensure everyone in the room is happy, your baby especially. Safety is our highest priority when dealing with babies, so we prepare our studio to the best quality standards for parents’ peace of mind. At Silver Bee Photography we understand responsibility that’s in our hands; not just to get stunning photographs, but to ensure a great experience for everyone. Trust Hillarry to keep your baby safe throughout a photo session. We’re vigilant, and we always have the comfort and security of your baby in mind. Get in touch with us today to schedule an appointment or learn more about our services! We are always excited to capture breathtaking photos of precious babies that you and your whole family will absolutely adore. We look forward to meeting you and your little one. See you soon!